Do you know someone who needs a little warmth this holiday season? Heat up the holidays with this holiday gift set . With four different hot sauces, this totally unique sampler pack is perfect for the hot sauce lover in your life. It even has a place on the outside of the box to write your "To" and "From". No wrapping required!! 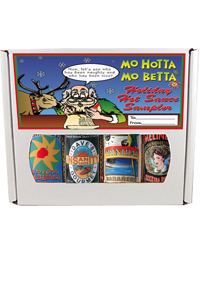 Sampler contains Dave's Insanity, Mo Hotta's Red Savina Habanero, Scorned Woman & Trinidad .